Middle-class disaffection is a well-mined seam in modern fiction. The notion that the trappings of a successful life can leave a person spiritually bereft, or simply lacking in some fundamental quality, has been at the heart of stories as different as CITY SLICKERS and FIGHT CLUB. Such tales of existential crisis and self-examination generally revolve around characters on the brink of a change in age bracket, employment, or relationship, but Rick Veitch's CAN'T GET NO goes one seven-league step further. CAN'T GET NO follows one man, Chad Roe, in the days before and the two weeks immediately after the 2001 terrorist attack on the World Trade Center in New York. Trapped in a sterile commuter routine, cut off from his self-absorbed work-at-home wife, Roe is so tightly wound that he can't even hold down his anti-anxiety medication. The collapse of his business, followed by his violation at the hands of a pair of feckless artists, sends Roe into a spiral of despair - at which point, the twin towers come down. Cut off from the life he knew, and standing out like a sore thumb due to his full-body tattoo, Roe embarks on an unusual road trip, finding solace in absurdity, and succour in the milk of human kindness. While the plot sounds somewhat clich�, both the format and the cultural context conspire to make CAN'T GET NO one of the most important, rewarding and ultimately compelling comics of recent times. 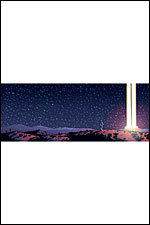 The book is printed in landscape format, at half the height of a standard comic book. At over 350 pages, it's the size and weight of a paperback novel. The landscape formatting restricts Veitch to no more than three or four panels per page, and offers the possibility of great panoramic double-page spreads. Indeed, at one point in the story, a framing trick finds the major supporting players joined by a single iconic image of the protagonist across a four-page snapshot in time. The story is told in wordless panels, although the missing dialogue is easily read from the expressions and body language of the characters. That said, CAN'T GET NO is hardly silent. A parallel narrative runs alongside the main story: a rolling prose poem, a sideways running commentary on the story, the author's intent, and the relationship between God, Man and Conscience. It's a fascinating, occasionally florid piece of writing that demands multiple close readings, and it augments the main story perfectly. Veitch's art is strong and idiosyncratic, combining sharp backgrounds and inky shading. 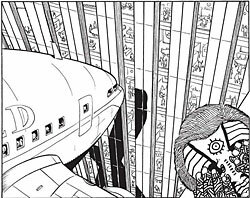 The book is tightly paced, shifting easily from still to raucous, and each scene and panel is excellently composed. Not an inch of paper is wasted. Veitch's characters run the full gamut of body types, and while many of them range from beautiful to grotesque, many more have a foot in both camps. The protagonist is deceptively well rounded, for someone who never speaks and has such a brief character arc. A lot of it is in Chad Roe's eyes: at the start of the story, they appear etched out of the page, rather than drawn onto it, as if Veitch had carefully rationed the ink at that point in the narrative. The effect is one of dissociation, as if Roe doesn't feel all there or isn't really real when the book opens. It is only after his odyssey begins - after his tattooing - that Roe's eyes are as tightly inked as everything else. The symbolic value of Roe's tattooing cannot be understated: it acts in much the same way as the narrator's insomniac breakdown in Chuck Palahniuk's FIGHT CLUB, freeing Roe from himself. He is able to abandon his former life, however briefly, and is released from his usual societal constraints. In that sense, he becomes an iconic agent of change for the people around him, as well as himself - a shamanic figure in a sticky autumn world. The iconic qualities of Chad Roe are enhanced by tying the story into the 9/11 attacks. Veitch invokes a lot of troubling imagery, such as the infamous 'Falling Man' photograph, and one subplot sees the lead defending a Lebanese couple from a group of off-duty soldiers. In many ways, CAN'T GET NO is Rick Veitch's answer to Art Spiegelman's IN THE SHADOW OF NO TOWERS, a response to tragedy that attempts to find a way for the protagonist, the artist, or America, to reclaim a sense of normality. Five years after 9/11, you might be forgiven for wondering if he's still looking. Matthew Craig is a writer from the West Midlands.